I have recently hosted workshops at Stanford and U.K.T.I. initiatives which were attended by C-suite from J.P. Morgan, Stanford University, Kissinger Associates, Apple et al. I have even hosted senior members of the UK Cabinet, along with coaching clients from Fortune 100 companies based in Silicon Valley and even royalty. I have found living in five different cultures (London, Rome, NY, Sydney, LA, Frankfurt, and Palo Alto) has played an important role in my education and evolution. Dida Connor is a communications expert who has worked for the United Nations Development Programme (UNDP), WHO, UN Women, the Australian Government’s Overseas Aid Programme (AusAID), the Food and Agricultural Organization of the United Nations (FAO), the Global Fund to Fight AIDS, Tuberculosis and Malaria, CARE International, Operation Smile and the WorldWide Antimalarial Resistance Network (Oxford University). Dida is based in London and Switzerland. Marie is based in the Dominica Republic and New York. 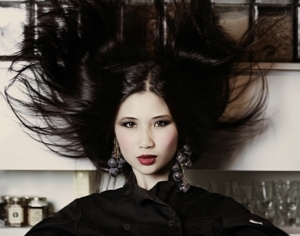 Chef Daphne Cheng is one of the most highly sought after plant-based chefs in the world with clients including Stella McCartney, Jessie J, Chris Hemsworth, MIA, Vera Wang, Moby, and numerous top Chinese stars. Daphne has been featured in Forbes, Vogue, SELF, WSJ, Eater, Well+Good, HK Economic Times, and more. Daphne is based in Shanghai and Los Angeles. Sabinije von Gaffke moderates and facilitates a variety of large, global events, conferences, symposiums and summits within Tech, Leadership, Innovation, ICT, Media, Entertainment, Digital Health to TEDX Talks. Consultant, strategic advisor and board member of a variety of impact initiatives, startups and investments. A spokesperson and moderator for WIT – Women in Tech Stockholm, the largest tech conference in the Nordics. On the leadership council board of leading NGO Vital Voices (founded by Hilary Clinton and Madeleince Albright) and Reach For Change impact venture: BRIDGIT. About to board an impact female tech fund in Q4 2019. Prior assignments on stage include: Brilliant Minds Symposium, Nordic Business Forum, Women in IT New York, Women in Tech, ICT Spring Europe, ICE Vox, TEDx, Asteroid Day, Super Content Marketing Conference, SKF ‘Let’s Talk, VideoMecca, SIME Social Impact, Stockholm International Film Festival, The Swedish Mobile Awards etc.